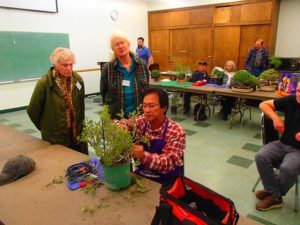 The April meeting guest will be Tom Vuong. Tom is a popular member of our club with his wife Hannah. 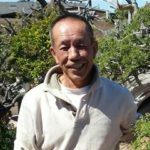 He is the past president of the Vietnamese Bonsai Society and has been involved in bonsai for over 20 years. 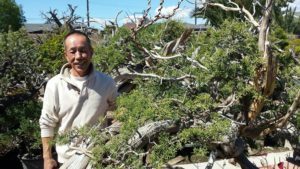 Tom is a self-taught bonsai artist, and has developed an amazing understanding of the art of bonsai. His styling techniques are well known, making him a popular demonstrator. Tom has a large collection of trees which he shared at an open house in March. Tom and Hannah graciously allowed fellow enthusiasts to come to their home and marvel at Tom’s beautiful collection and have lunch and visit. We had a great time. Tom will show us wiring techniques as he styles a conifer at our meeting in April. When I view trees in a show, I always appreciate the tree and pot combinations that go well together. Having the right pot to complement a tree is important. 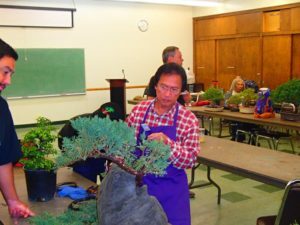 I reviewed John Naka’s chapter on selecting a pot in “Bonsai Techniques” as a refresher to share some of the basics as a reminder to all of us. Acceptable colors for most trees are brown, gray, or terracotta. Glazed pots are generally used for deciduous trees, while unglazed pots are best for evergreens. Glaze colors should be similar to the color of the tree leaves, flowers, or berries. The length of the pot should be roughly 2/3 the height of the tree. If the foliage is wider than the tree height, the pot length should be about 2/3 the width of the tree foliage. The shape of the pot should fit the style or character of the tree. Most trees will look acceptable in a rectangular pot, but a tree with a curvy, moving trunk can look better in an oval or round pot. John Naka said a powerful, rugged looking tree should be in a similar looking pot, staying away from a pot with soft lines. I think the best way to select pots is to view show trees, in person or in pictures. You will see what looks pleasing with different tree styles. Then apply what you see to your own trees. The most important highlight was that Peter Macasieb stepped in and handled our workshop after Roy Nagatoshi had to cancel his appearance. Peter brought trees for the tree raffle we had planned for, and he did a great job working with members and their trees. 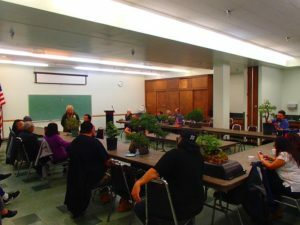 He took the time to talk to the entire group about each tree and what he recommended in the way of styling. Peter’s process was valuable to the tree owner and all of us watching. There were many different tree types and styles present, so the learning experience covered a variety of situations. The lucky tree raffle winners were Gary Lai, Jim Pelling, Mike Kelly, Linda Gonzalez, and Robert Sencer. Thank you to all who came out in the rainy weather for the meeting. The weather made it more difficult to bring in trees, but our great members took it in stride. We were rewarded with a wonderful workshop experience. This is just a gentle reminder that it’s now time to renew your 2018 membership for SABS. A special thank you to all of you who have already renewed for this year. Our membership dues are vital to SABS remaining financially viable. The dues for each year are due in January. Past members who have not yet renewed are encouraged to do so at this time. If you joined SABS during Oct-Dec 2017 then your membership is current until Dec 2018 . It has been exciting to see how SABS’s membership has grown during the past year. Thanks for your participation and support.